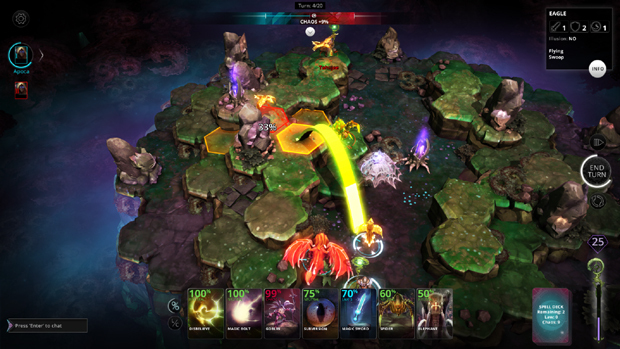 Chaos Reborn is an attempt to re-imagine and bring back to life the cult classic 80’s game known as Chaos. The game is being brought to us by the creator of the original X-COM, Julian Gollop. 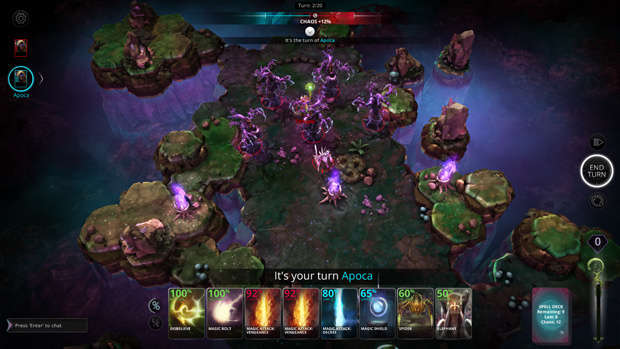 Just as with its predecessor, Chaos Reborn will be a turn-based strategy and tactics game in which wizards are pitted against each other in an arena, using spells and summoned creatures to do battle. You’ll have over eighty spells at your disposal, including twenty-four mythical creatures to summon. The end goal is to not just offer a multiplayer battle game, but to also offer a massive RPG component. I never had the chance to play the original Chaos, but I am ecstatic to get a chance to play Chaos Reborn. Before I get too far into the article, I want to make it clear that the version of Chaos Reborn I’ve gotten to play is a very early iteration. What I’ve experienced so far may not resemble the end product at all. Which is understandable considering a majority of the planned features are not yet available, but I get into that more in the “The Future” section. Now that I’ve said that, let’s get into the basics of the game as it currently is. 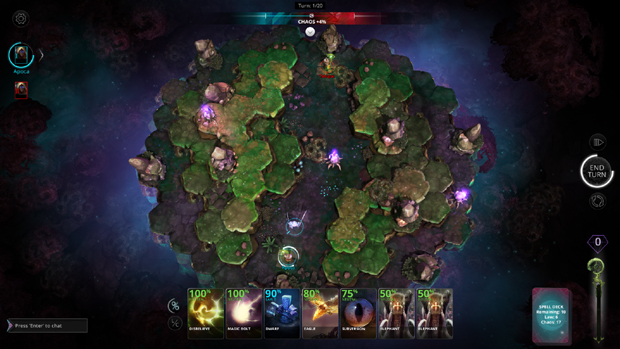 The game is a mixture of a board game and a card game. When you play, you have a deck of spell cards that can be played. Each turn you’re allowed to play a single card. These spell cards have a range of abilities, but some of the most interesting are the summon cards. Summons allow you to do what the name suggests – summon mythical creatures to fight on your behalf. These creatures can range from dwarves, to elephants, to unicorns. Some can fly, some can snare, others can be turned into a mount for your Wizard to ride. Each has unique stats and abilities, which makes things quite interesting. There’s just something awesome about summoning a sword, a shield, and a unicorn mount for your Wizard to ride into battle. 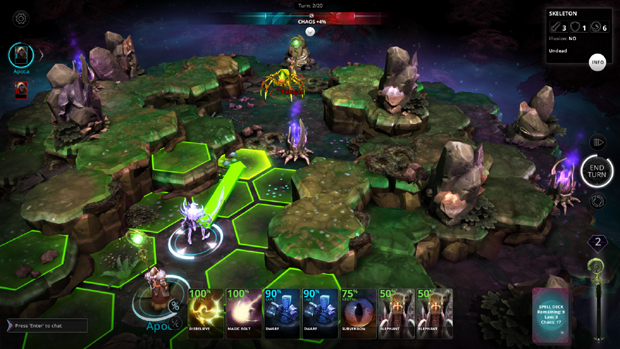 The utility that creatures can offer adds a lot to the strategy of the game. Casting seemed a bit odd at first. Depending on the usefulness of a card, it’ll have a percentage chance to result in a successful cast. You can also cast just an illusion of a monster for a 100% chance, however it won’t be able to actually do anything to your enemies except to act as a bluff. So a basic goblin would have a 90% chance success, while something like a Spider would have a 60% chance. You can use mana to increase this chance, which is gained by sacrificing cards. So if you have a powerful card, you may want to sacrifice a handful of weaker cards to turn its very low summoning chance into something reasonable. Strategy plays a big role in the game. For now, you’re given a fairly limited number of cards for your deck. As I said, you can only play a single card each turn and each card has a percentage chance for the card summoning to work, with the only way to increase that being the sacrifice of other cards. Creatures have special abilities and stats that dictate stuff like how far a creature can move each turn. There are a lot of variables to take in and make use of, which leads to a very rich strategy experience. Arenas are where the battles take place. At least for now, they’re not that big – big enough to allow for placement to be important, but small enough to encourage frequent conflict. Terrain can play an important part in the battles – which is nice – and there are certain things on the map to help spice things up. Not the mention that the graphics are simply beautiful. 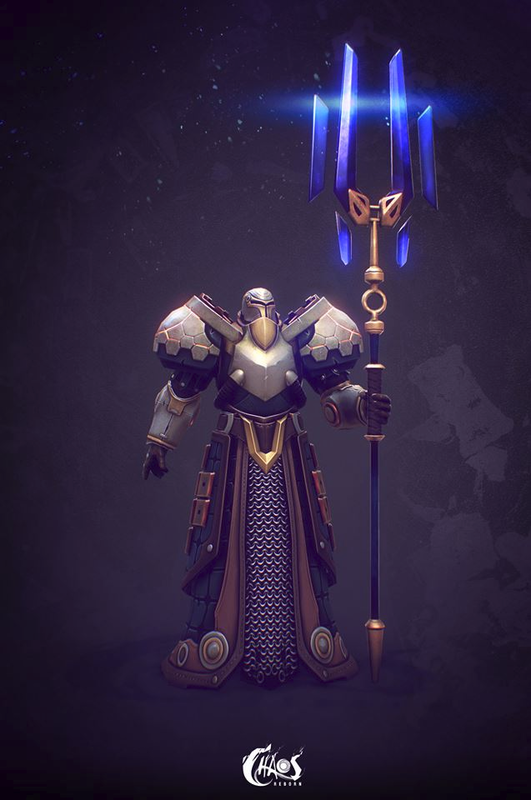 They may not have the highest poly count, but they have a fluid and stylized artistic style to them that is reminiscent of games like World of Warcraft or League of Legends. Further down the line, we will be introduced to Realms. These will be procedurally generated or even designed by our fellow players. As it’s not in the game yet, all I can do is read what the developer has planned and speculate. But I have high hopes for how fun exploring the realms will be, battling Wizards and building my spell deck. I’m also looking forward to seeing much more of the graphic style the game has, as I’ve found myself enjoying what’s already present in the pre-Early Access version quite a lot. Each card has an alignment – Chaos or Law. At the top of your screen there is a bar that represents the “Balance,” that goes back and forth depending on certain actions that the players do (such as casting spells). 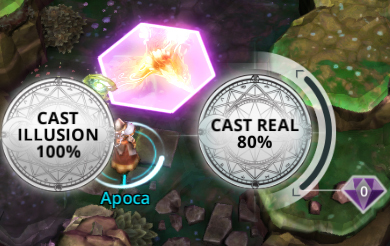 Depending on what the Balance currently is, and the alignment of the cards you are trying to cast, you may get a bonus for your casting. For example, if the Balance is at 4% Chaos, rather than just a 90% chance to successfully summon a Goblin (which is a Chaos creature) there will instead be a 94% chance. It’s an interesting mechanic that helps encourage smart plays. I actually explained a number of the current rules for battle in “The Basics,” Keep in mind things may change in the coming weeks or months, so don’t treat this as the be-all-end-all concerning battling. As I’ve said already, strategy is key and tactics are an important factor. The game actually reminds me of a very animated and advanced form of Chess. They’re obviously quite different, but the same kind of thinking can be applied when playing Chaos Reborn. Each player gets a turn where he is allowed to summon one card, sacrifice as many cards as he likes, and make use of his creatures. The end goal of the match is to defeat all other wizards. Currently, there can be up to four players, either in a “free for all” or 2v2 style. You can also do simple 1v1s as well. I’m not quite sure how things will pan out when it comes to the single-player RPG, as it’s not yet in the game. When attacking a creature, fighting is fairly straight forward. Either the creature dies, or it survives. There are no hitpoints to deal with, and (once again) the chance to defeat a creature is a percentage based on the attacker’s attack points and the defender’s defense points. You can gain bonuses or penalties depending on the terrain, and there are a lot of special cases when it comes to the creatures. For example, an eagle can fly and therefore can get over terrain obstacles. The special abilities of the various types of creatures are something I enjoy a great deal. Although there will be a wide-variety of spells available (up to eighty), I’ve found the creatures to be both the center and the most interesting aspect of the match. Like I said earlier, certain creatures are eligible to be mounts for your wizard. There are also other special circumstances – such as the bonus an eagle gets for attacking from higher terrain or how spiders get a chance to web an enemy when they attack, so even if it doesn’t get killed it will be snared. However, a majority of the spell cards aren’t creature summons. Early on, you seem to have a very limited deck. 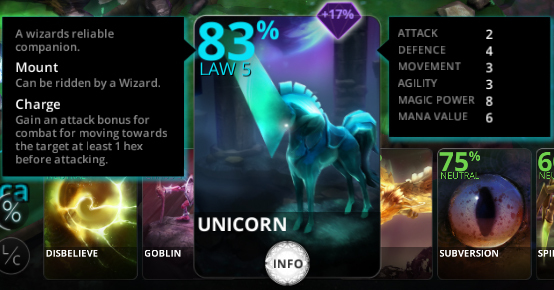 The driving force of progression in Chaos Reborn seems to be acquiring new cards. The end goal is to have at least eighty spell cards, only twenty-four of which will be creature summons. Examples of the spells include creating a magical sword for your wizard to increase its attack or the ability to disillusion the fake illusion summons I talked about earlier. Of course there’s the normal attack spells and I imagine a diverse set of other spells, as well. 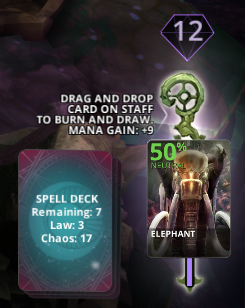 A lot of what will make Chaos Reborn a great game (and I can already tell it will be) is not yet in the game. Sure, the battling is already a blast – especially when you’re playing with friends over Skype or Teamspeak. But things like the equipment system, the single-player (And Co-Op) RPG elements, guilds, etc… will do a lot to boost an already fun experience. I’m not quite sure how the RPG part of the game will pan out, but the developers wish list seems to be quite a long read. My personal favorite highlight from that list though is the upcoming equipment system, set to implement yet another level of tactical decisions and unit variety. As the game was made using Unity, it’s going to be quite a bit easier for it to be ported to other platforms. Browser-based, Windows, Mac, and Linux are planned for release. There are also plans to make it available on iOS and Android, too, although the Kickstarter suggests that this may appear much later. I’m looking forward to being able to play a mobile version of the game, though, as the gameplay seems ideal for gaming on the go against a close friend. 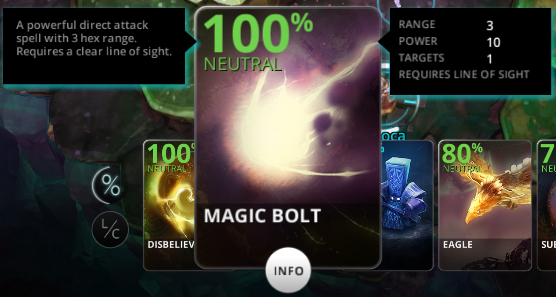 Chaos Reborn definitely has a lot of potential. It has a well-respected and talented developer backing it. Combine everything a lover of strategy could want in a cult classic 80s aura and you’ve got Chaos Reborn. Badass throwback music included. With its experienced developer and the successful kickstarter (which went $30,000 over its goal), I have no problem believing that all the promises will be delivered. 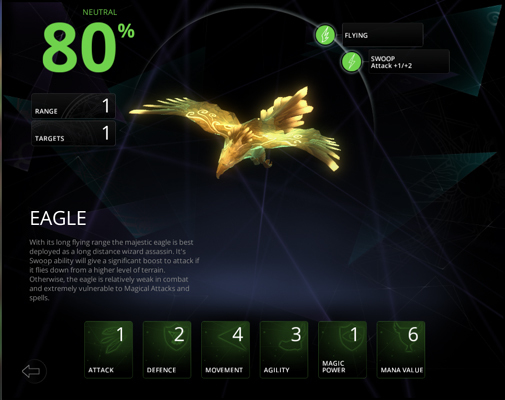 I would definitely suggest that you check out Chaos Reborn, now that it’s available on Steam Early Access. Even if you don’t play the game right away, it’s worth keeping tabs on.